Home » Festivals » Dasara Dolls Arrangement Ideas and Where to Buy Them? Mysore Dasara is a 10 day festival of colors and joys being celebrated for the victory of goddess Chamundeshwari over the demon Mahishasura. Nadahabba Dasara festival takes you back to the history of Vijayanagara Kings and royalty. Dolls play an important role in the festival. If you are looking for dasara dolls arrangement ideas, read on. The city Mysore is well known around the globe for its Dasara celebration. During Dasara the Mysore palace glows with 100,000 light bulbs in the evening, Dasara procession known as “Jamboo Sawari” is held on the streets of Mysore where a decorated elephant carries goddess Chamundeshwari’s Mantapa. When it comes to Dasara celebrations Dasara Dolls can never be forgotten. Dasara derives it’s another name “Bombe Habba” in cause of Dasara dolls arrangements. 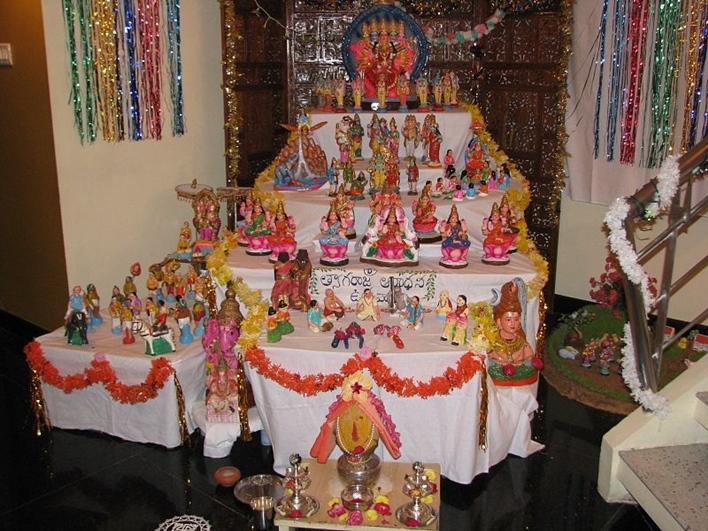 Almost every household in and around Mysore celebrate this day, where dolls are arranged in themes. Young girls are invited and are given “Gombe Bagina”, a gift box which contains sweets, toys and a pair of wooden dolls. Intention behind the gift is that they can continue the tradition when they grow up, get married and move to a new home. The dolls can be a combination of anything like older dolls given by mother or mother-in-law, clay or silver toys. Every arrangement has tiered platforms covered with a white sheet or any silk sari. Usually goddess Durga’s or Chamundeshwari’s idol is made the center of attraction of the arrangement. Traditional dark colored Raja-Rani Toys are kept on the middle tier, this pair of toy is a part of every year’s doll arrangement. The top most platform of the arrangement has the idol of the god who is been worshipped in the respective house. The next respective platforms depict stories like Dashavatara, Seeta Vanavasa etc. Some of the platforms have dolls which show day to day activities of man and woman. The last and the final tier usually has garden themes like wild life sanctuary, farmer ploughing his land, animals grazing. These days some of the households have a tier of dolls to educate visitors on society concerns like environment protection, women empowerment, child education and health. Again, there are no should and must ways to decorate your house with dolls in Dasara. Women folks of the house use their imagination and creativity to create a beautiful story through these dolls. Dolls are maintained and cared for decades and passed on to the successive generations. Where to buy Dasara dolls? Once the Dasara festival starts getting closer and closer, dolls start appearing on every street corner of the city. Bangalore and Mysore city conducts many exhibitions of glamorous dolls which are affordable and hence buyers do not feel the pinch of buying costly dolls. Dolls can be made up of wood, hard plastic, paper, marble or Plaster of Paris. Dolls can also be china dolls, wax dolls or paper mache dolls. Wooden dolls: Channapatna is the best place to purchase wooden toys if travelling is not a concern. Channapatna is 6o kilometers away from Bangalore. Wooden dolls are easily available in Bangalore too. 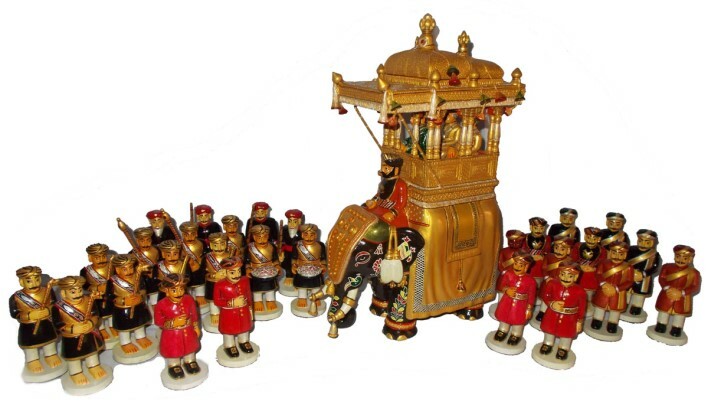 There are many wooden and clay toy manufactures in and around Mysore as well. Hard plastic dolls: Major shopping areas of Bangalore like GandhiBazar, Chickpet, Jayanagar have shops selling hard plastic dolls with price range between Rs.100 to Rs 1000. Plaster of Paris: Plaster of Paris dolls come in various sizes. They range from little tiny toys to large statues. Small Plaster of Paris dolls can be found in any gift shops in major parts of the state. Marble Dolls: Marble dolls are the costliest one and require lot of care and attention. Chickpet, Basavanagudi, J.P Nagar and Malleshwaram areas in Bangalore have some of the best marble dealers with beautiful idols. The starting price range for a small marble statue is between Rs.7000 to Rs.8000. If you are in Mysore there are many stores in the city where you can buy all kinds of dolls. An example would be Ramsons one of the largest handicraft shops in the city. The store is right in front of Mysore Zoo. The days where every household having doll arrangement may be long gone, but Mysore and Bangalore city has not forgotten its tradition. Dasara is the time where old dolls are taken out from attics, cleaned, dusted and beautifully displayed. Doll arrangement is an occasion of wonder and happiness to both youngsters and adults with every doll narrating its own different story. Hope these Dasara dolls arrangement ideas has inspired you enough. Have a wonderful Dasara.